Why I Love Blogging... But Don't Want to Blog Full Time. In September, it will mark 6 years since I started Southern Belle in Training (!!!). I never expected when starting a blog during my freshman year of college that it would be such a big part of my life so many years later. 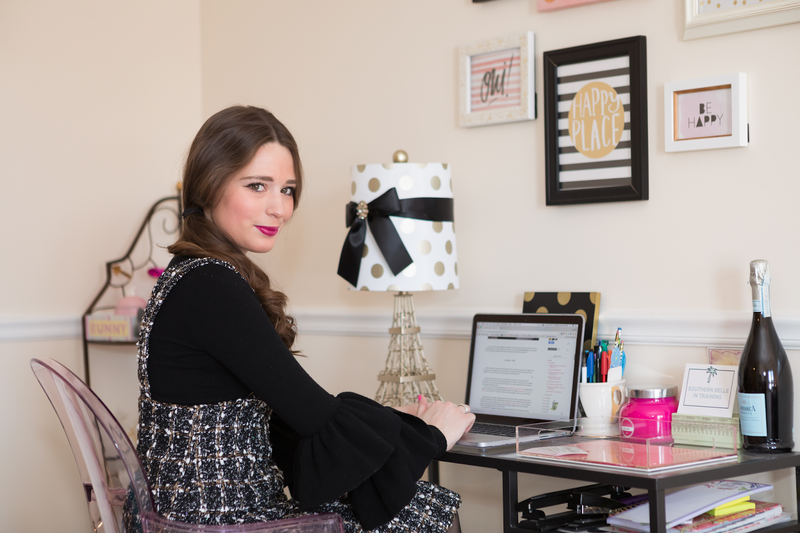 Blogging is one of my greatest passions, and I mean it when I say I can't imagine what the last several years would have been like without it! Something that I've started getting asked a bit in the last year especially is "Do you ever want to make Southern Belle in Training your full time job?" My answer, which usually surprises the person who asked the question, is always "Nope!" There's several reasons behind the fact that I don't personally want to be a full time blogger, and I thought that might make for an interesting blog post topic. Hence why I'm sharing this today! Photo by Amanda Rose Photography - from this blog post where I shared a tour of my blog office in my former apartment! Disclaimer: I don't mean for today's post in any way to bash any women (or men?) who have decided to be full time bloggers/influencers for their career. Many of my favorite blogs that I read on a daily basis are run by total boss babe women who blog full time, and actually some of my good blogging friends (who have become real life friends) blog full time as well. I totally respect someone's decision to do that if they feel that's where they want their career to go (and are in a financial place to afford this!).... 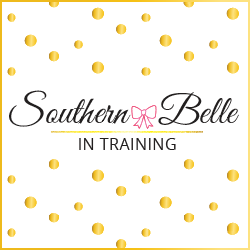 today's blog post is simply to share my personal reasons for why I don't see this being Plan A for Southern Belle in Training. Loss of financial security: This is the biggest reason! Being an adult is expensive. In addition to the normal daily expenses, life throws financial curveballs at you all of the time. Surprise car maintenance, medical emergencies, unexpected but necessary travel... etc. And these are just necessary expenses! I'm not even talking about saving and investing for the future, or having extra money to treat yourself or those that you love. Like I said- adulthood is expensive. I personally love the financial security of having a day job and a paycheck that arrives every two weeks. Radio jobs aren't known for their financial abundance (people join this industry for the passion, not the paycheck), but I have learned how to be thrifty and stretch my paychecks, and I'm able to cover all of my expenses, pay the bills, and still save a little bit. However... the thought of trying to live off of income with the type of blog campaigns that I'm currently being offered right now? YIKES! I can't even imagine. I give so much props to the amazing women that are able to grow their blogs and brands into something that is able to be many times more profitable than their day job was (and many people do that!)... however many bloggers also aren't able to do that, and it's important to be realistic if you fall into the latter category. Loss of benefits: This comes second after loss of general financial security! Health insurance isn't something that I ever thought much about in the 22 past years of my life, but this year since I started working and being offered benefits... yep, I'm now thinking about it! I used to be so naive that years ago, I just assumed that if you worked full time, your employer covered all of your insurance costs. (HAHA nope!! Out it comes from those paychecks!) Even though I now am well aware that employees do have part of their paycheck removed for healthcare, I am thankful to have a full time job that offers healthcare and dental plans, and helps offset some of the costs! It would be very overwhelming to think about covering the costs for insurance 100% on my own. Sort of along the lines of this- most full time jobs also offer the chance to begin a 401k or some sort of retirement savings plan. While it is of course possible to do that while being self employed, it's a huge benefit when your company is able to match your contributions! Lack of motivation: Even if financially my blog was doing absolutely amazing financially and it made more sense for me to leave radio... I still might hesitate! I thrive the best in all aspects of life when I have a very set routine, and stay as busy as possible during weekdays. Working a 9-5 (technically a 10:30-6 with my current radio schedule) works VERY well to keep me motivated with blogging. I wake up early each morning excited to work on my blog, and return home from work every evening excited to continue working on the blog or social media. Having a day job makes me value the time that I do get to spend on my blog that much more, and therefore makes me more productive and able to balance both things. If I worked for myself 100% of the time... I'm honestly not sure how I'd stay on track all of the time! I love getting dressed and ready everyday for work and having my weekday work routine. I feel like it would be hard to get into that groove for working for myself- knowing my personality! I think I do a great job balancing working and blogging, and I look forward to continuing this for awhile to come. No PTO: Okay- this one is a pro/con. (Disclaimer that radio is not an industry known for generous time off... there are definitely other types of jobs that are much better for this with their employees than my field.) But still- I do get some PTO each year, and it's amazing to know that you're still getting paid your normal salary to take a vacation! When you work for yourself, there is no PTO. Yes- technically everything is PTO (This is great for travel bloggers! You can just pick up and go at any time. ), but at the same time, nothing is PTO! If you ever want to take a non-work related trip and just disconnect for a bit, that's a complete loss of income or potential business opportunities for those days. So these are my reasons for why I am happy with working full-time and also continuing to blog as my side hustle. I am so thankful for the opportunities that I've had over the past few years to monetize my blog, and I hope to only continue to grow that! I have told some friends before that my current financial goal with Southern Belle in Training would be to match my first salary (at my former job) with income from Southern Belle in Training- so that way even though I'd still be working full-time in radio, I'd have two full time job "salaries", and it would allow me a lot more financial freedom! But if that goal doesn't happen, that's okay too. It's not something hard and fast that I'm forcing myself to reach by a set date, but more something that I can work towards in the general future. Thanks for reading today's post! I'd love to hear your thoughts on this topic. If you're a blogger yourself: is your goal to blog full time (or are you already? ), or are you like me and want to keep your day job? I love that you have a day job that you can be passionate about! In the end, if you have the security and you're happy that's all that matters and you are KILLLING the blogging game!! YES!! I love blogging when I first started but now I struggle with it. I still love reading post, posting on occasion but it's not the be all end all. I dont feel like I MUST blog now. Keep rocking lady! I totally get it, and constantly have to work at finding the right balance between "blog" and "work" -- and in my case, they overlap a lot, so that makes it a bit more complicated. Sounds like you're on the right track! You took so many of my feelings right out of my head! :) I love that my blog is FUN & my happy escape from stresses of real life, so I don't think I would want to do it full time because it would take that quality away. Plus I love my 9-5 and the stability it provides! I'm the same way in that I don't want to ever quit my day job an I want my blog to exclusively be a hobby. I feel like if it became my job, I would hate doing it haha. I'm reading these and going, 'same, same, same!' lol Girl, you're definitely not alone! A lot of successful bloggers don't want it to be their full-time gig! Loss of benefits and no PTO are two very important considerations to anyone considering self-employment. Thanks so much for highlighting the financial challenges blogging full-time presents. It can be great, but it can also be very not great if you end up sick or unable to save for your financial future. Great post, Annaliese! I love this! I always thought I’d want to be a full time blogger (although im definitely no where near that point yet). I’m temporarily not working bc we’re about to move and I feel like I was sooo much more productive with my blog when I actually had a 8-5 work schedule. I think i thrive on being busy. It worked so much better for me. As soon as we move I am ready to find a full time job again. I also have no desire to make my blog my full-time job. I love having it as my "side hustle." Lately though, it hasn't even been a side hustle, just my place on the web to share my thoughts! I just love this post! It is so honest and full of insight. Whatever blog I've read I saw people hating their day-time jobs and saying blogs where their dream-come-true. However, I fell like if you are only focusing on blogging you never get time-off. It's like a continuous job you have to do day and night to keep your blog up and running. Researching subjects, writing, photo editing, social media. All these takes a whole lot of time. I mean it can be a total satisfaction for some and less for others. I totally feel this. While I do admire full time bloggers it is not my ministry. It would burn me and and the possible instability and uncertainty are big no no’s. My blog is very much my creative outlet. Totally agree with this! Back in the day I thought it was my dream to work on my blog full time. Once I became engrossed in it every day, I realized it's not as exciting and fun as it was when I only wrote when I was passionate about something (kind of goes along with your "lack of motivation" reasoning). My other reason was the big financial security one too! Now, I feel less pressured to promote content all of the time and use it as my creative outlet. I totally agree with everything you mentioned in this post! I totally respect what full time bloggers do but I really enjoy my day job and it's a secure way to earn an income, have benefits, PTO, stock options, etc. I started my blog up because I wanted something to channel my energy toward while I'm not at my 9 to 5. Never thought it would turn into what it is today, but I'm happy with how far I've come and how blogging has opened so many doors. It's amazing that you love your day job and blogging just as much! The financial security point is one of the main reasons I'm a bit hesitant to pursue blogging as a full time job too, for right now. Amen to this, Annaliese! As much as I love blogging, I don't think it could be my full time job- at least for right now or the near future! BIG LIST of Great Books to Read This Spring!! Prom & Formalwear Trends 2018.